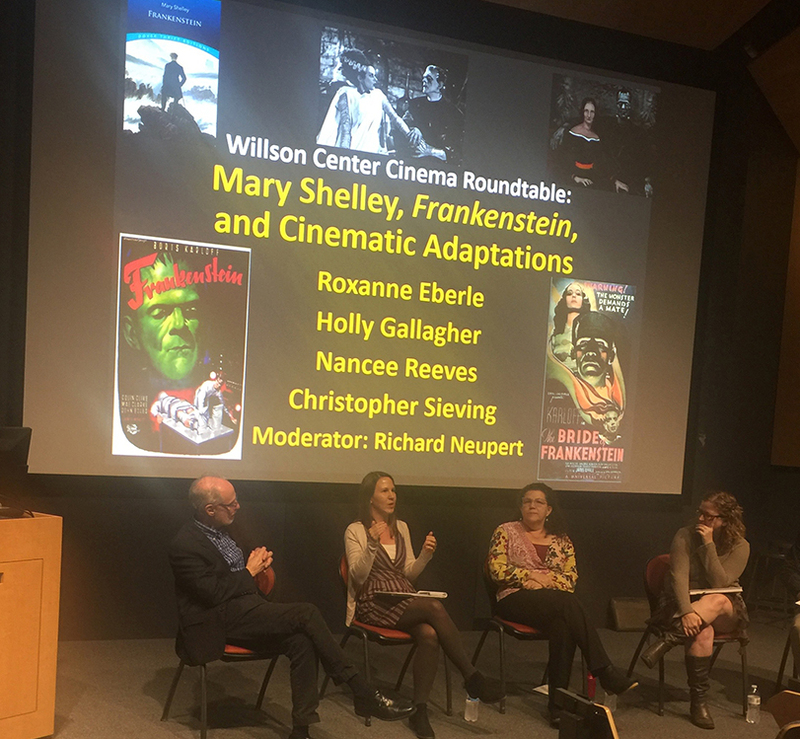 The UGA English Department joined the Keats-Shelley Association of America and the NEH in an international celebration of the 200th anniversary of the publication of Mary Shelley’s Frankenstein. Frankenreads events occurred in over 700 international venues. The Georgia Colloquium in Eighteenth and Nineteenth-Century British Literature, directed by English faculty members Dr. Roxanne Eberle and Dr. Casie LeGette, collaborated with UGA Libraries, the DigiLab, the Department of Theatre and Film, the Willson Center for Humanities and Arts, and the Undergraduate English Association to offer a host of Frankenstein activities during the month of October. On Halloween, Wednesday, October 31st, over 50 readers participated in a marathon reading of the novel, which began in the newly renovated Einstein’s Café in the Main Library at 8:00am and continued at that venue until 6:00pm. The final 30 minutes of this epic reading reading event took place at Ciné, Athens’s local independent movie theater. Dr. Peggy Brickman (UGA Professor of Plant Biology), Dr. Megan Morgan (UGA English PhD, SPIA Graduate Program Advisor), and Dr. Joshua King (UGA English PhD, Interim Associate Director of First-Year Composition) gave dramatic readings of the novel’s closing scenes while dressed in costumes as the Bride of Frankenstein, Mary Shelley, and Robert Walton respectively. The Frankenread was accompanied by a striking slideshow of images drawn from popular culture, which was curated by Dr. Christopher Pizzino (Associate Professor of English). The Main Library and the UGA DigiLab hosted a movie marathon throughout the day, offering free popcorn and the opportunity to make Frankenstein memorabilia. The libraries also curated two associated exhibits. A display of Frankenstein texts and related material was featured at the Main Library and “Making a Monster: A Writer’s Inspiration” appeared as part of the History of the Book exhibit in the Special Collections Library's Hargrett Signature Gallery. In the days just prior to the reading, the Undergraduate English Association hosted a trivia contest and a book giveaway. Copies of Frankenstein were donated by English Department faculty and students, and by Broadview Press. UGA’s Frankenread received considerable attention, with an article written by Heather Skyler for UGA Today later appearing in the Athens Banner Herald . Kyra Posey’s description of the event appeared in The Red and Black and Dr. Eberle was interviewed by Alexa Ridley for WUGA. UGA undergrad John DeGaris reads to his classmates from Dr. Eberle's English 2320: British Literature after 1700.